So here’s my dad somewhat nostalgically patting his 1993 Ford Taurus that he cleaned out of all kind of stuff as he planned on trading it in and driving away with a new Toyota Camry. There was a sales ad in the newspaper for the last of the 2004 models and it seemed to have everything he wanted. Incredibly the Taurus has only 32K miles on it. My folks don’t drive much anymore. 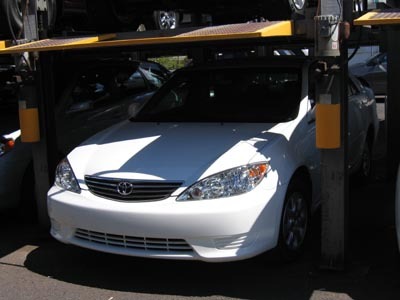 We went into Toyota and asked about the 2004 Camrys they had for sale. Good news and bad news. They did have several 2004 models for sale, the bad news is that none in the color he wanted, white. The only ones left were dark blue, black and dark brown. So we took a spin in the blue model, which wasn’t as dark colored as the sample swatches in the dealer’s book. I told my dad to take the wheel, after all he would be the one driving it the most, my mom in the front seat, me in the back with the sales guy. Off we went, sort of. My dad had to adjust to having the shifter on the floor instead of on the column, is that why the windshield wipers kept going on? After maneuvering out of the tight parking lot, to the sales guy’s relief, we headed out on the road. I could sense the guy tensing every time my dad put the pedal down testing out the V6 engine and driving past residents swinging open car doors into our lane, city buses roaring past and pedestrians crossing the road every which way. The salesman must take a few days if not months off his life every time someone takes one of these new cars out for a test drive. The car is pretty comfortable, has a tons of storage compartments inside the car, has lots of power, a cavernous trunk and looks pretty good. Back in the dealer’s office the salesman found that for a little more my folks could get a 2005 model in white. They’ve got lots of them since it’s the new model. So we went outside and found a 2005 Camry LE with a V6 engine. My dad refuses to get a 4 cylinder engine, I would guess that if he could get a Camry with a V8 he would. There it is, the car he wants in the color he wants. We take a look inside and it all looks good. My folks are ready to buy it and drive home leaving the Ford Taurus behind. My mom whips out the checkbook, ready to make the purchase, my dad is looking forward to this spankin’ new car. The salesman tells us, “That car is already sold, you can’t have it. 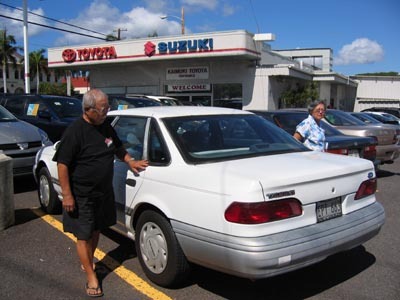 We have a more cars at our Sand Island lot and we’ll have to bring one over.” My folks look a bit stunned, all ready to drive home in a new car, all ready to ditch the old car. The salesman tells us it would take one week to prep the car and be ready to be picked up. Back in the dealership the salesman and finance guy try to convince my folks to get undercoating and other nonsense, they reject all that extra crap. My mom writes a check for the car, no financing needed, and tells the salesman to stamp the payee section with the dealership. He says okay and tells us to wait and disappears…for a long time. Our minds wander and we speculate that he’s written his name in the blank space and is heading for the airport for Las Vegas. Or he’s made the sale for less money and pocketed the difference. At this point I’m surprised that my mom hasn’t seen the movie Fargo where William H. Macy does all kinds of shenanigans as a car dealer. My mom also laughs and says maybe he split the money with the finance guy and both are going to Las Vegas. Then she laughs and said I watch too many movies. After finally signing all the paperwork they exit the dealership, by this time I’m roaming around the lot looking at cars and making phone calls. We get back into the old car and head off for some shopping with my folks nostalgically talking about another car they had traded-in like it was a pet horse turned in to a glue factory. People get attached to their cars, my folks are no exception.